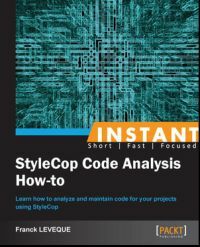 This time Packt publishing sent me a review copy of StyleCop Code Analysis How-to by Franck Leveque. It's a book from their new Instant series; much shorter than the technical books usually are. This was the first Instant book, I got my hands on, not really knowing what to expect. Though, the book quickly turned out to be a very effective guide to using StyleCop and integrating it with other development tools. No matter which ones you are actually using, the book should be more than enough to get you going even if you've never used StyleCop before. Not only that, it also addresses some common issues and gives useful hints for working around them. Based on the table of contents I was still hoping for more in-depth information on creating custom rules. You'll definitely need to get additional guidance elsewhere before implementing any yourself. In spite of its shortness, the book contains much useful information, at least on the consumer side of the tool. Don't count on any really advanced topics, though. Still, I would suggest the book to anyone thinking about seriously using or even just trying out StyleCop. It should be the best source to quickly get you started. It also gives enough pointers for the next steps by briefly describing its broader ecosystem.